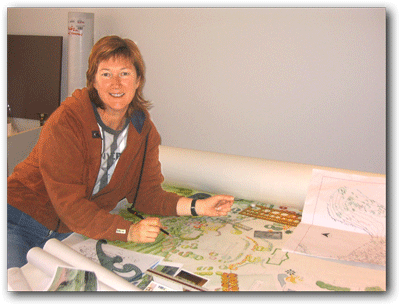 Christine Hay is a Landscape Architect with twenty years professional work experience. Christine greatly enjoys working with clients, gaining inspiration and ideas from sites and people to weave into sophisticated landscape designs. This makes her a great asset to any landscape project requiring creative input and thoughtfulness. Professionally Christine has tended to focus on the conceptual design area in her work. Christine has completed the urban horticulture certificate at Ryde, Horticultural College + maintained an interest in planting design, urban design, architecture and heritage issues. To keep her work fresh, thoughtful + interesting she has completed a National Art Course in drawing, together with a four year course in painting and now exhibits regularly. Major projects have included Mascot Park redesign and conceptual streetscape designs. Commercial residential complex at Campsie. Past experience has also included state government projects, local government and private consultancy work. Previously Christine worked for Botany City Council focusing on streetscape design, documentation, theming of Parks + major Council projects. Other relevant projects include the Blacktown Olympic Site and the upgrade of the Streetscape at Wentworth Avenue, Mascot and Pagewood. Christine has also enjoyed a number of years in private Landscape Architectural practices mostly in Sydney but also Brisbane + London U.K.
1991-93 Certificate of drawing, National Art School, Darlinghurst.